What are Work Locations in GoCo? 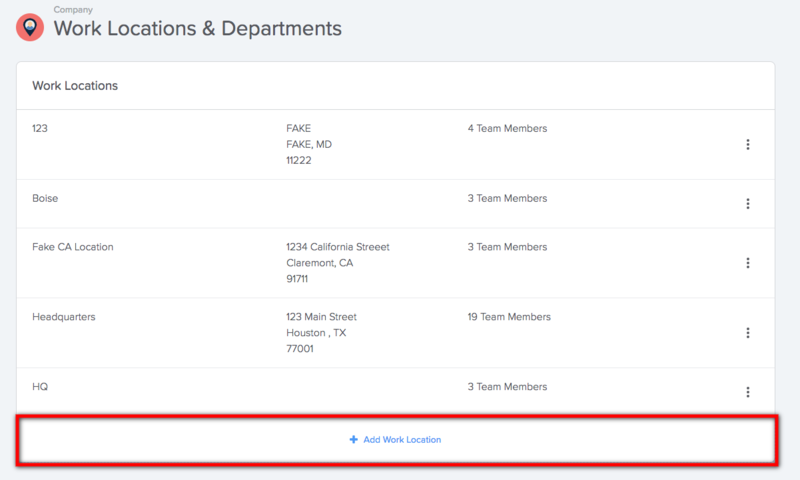 In GoCo, you are able to setup locations that represent the different physical locations that your employees work at. You are able to set the locations per employee, which can determine the employee's tax forms as well as benefit options. From your company page, you will notice a Locations & Departments module located in the bottom left hand side of the page. Click on the Manage button. A list of any existing locations will be displayed. To add a new location, click on the +Add Work Location button located below the list. Note: To edit an existing Location, click on the more options icon (Three Dots) located to the far right. 3. A pop up window will appear that will allow you to input the location address. Click Update to save changes. 4. All Done. Easy as riding a bike! From the company page, click on either the Team link within the menu on the far left side, or View directly within the Team card. A list of all employees in GoCo will be displayed. Use the search bar at the top of the list to type in the employee's name. Once you locate the employee and open their profile, you will notice an Employment & Compensation card. Click this section to expand it. The employee's information will be shown, such as start date and work location. Click the blue Make Changes link located in the top right hand corner of the section. 5. You will now need to provide a Date & Reason for the change. Once inputted, click the Continue button. 6. Now you will see all of the employee's information listed, with the option for you to make changes. 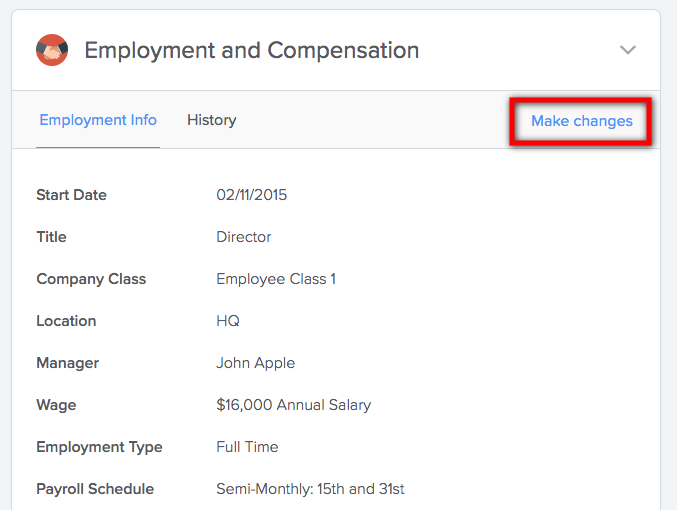 In the dropdown field for Location, select the new location for the employee and click Continue. 7. A notification will be displayed, letting you know if this change will effect the employee's benefits. Click the Continue button. 8. If you are using GoCo for Payroll Sync, a message will appear letting you know that the payroll Admin will be contacted and asked to sync the employee's changes with payroll. Click Continue. 9. In this last step, you will be asked to review and finalize the location change. When you are ready to submit the request, click on the Review & Finish button located in the bottom right.